At LuxNetwork S.A., diversity is a natural practice part of our DNA and already implemented in terms of HR management and respect for employees. LuxNetwork S.A. is a young and dynamic Luxembourgish company. It knows an important growth and aims to recruit talents from all backgrounds. At LuxNetwork, we want to bring out and support both female and male talents in a profession that is traditionally male. The average age of the team is 33 years old with a delta going from 22 years old to 50 years old. We are proud of the miscegenation of our employees: we have 7 foreign origins and 3 nationalities. Becoming member means for us getting aware of our values and relying on the IMS charter and expertise in order to better communicate internally and externally. The concept of Part & Act: we are seduced by mutual help, exchanges based on volunteering and openness to others. We believe that these expressions of collaborative work make sense in our modern societies, and make it possible to strengthen the true relationships between people. The yearly forum is an opportunity to decrypt and analyse the news of sustainable development. It is also a place to attend conferences of great international personalities who work on sustainable issues. 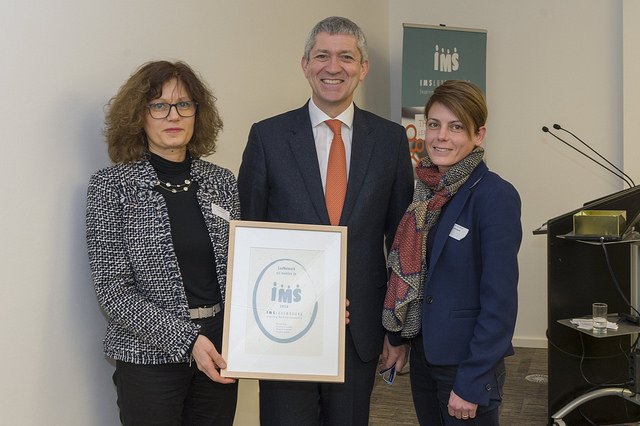 Finally, the actions carried out by the IMS, events, meetings and exchanges are all sources of inspiration to stay on course and help us to progress in our CSR approach. ​LuxNetwork S.A. is part of the French group “Groupe Nomotech”, which conducts a CSR policy with all subsidiaries of the group. LuxNetwork therefore benefits of good practices and studies conducted on the topic. In addition, LuxNetwork wants to launch and customize the Group's CSR policy in Luxembourg. We have the strong determination to promote the environmental and societal values brought since the founding of the company by its founder, Luc Lutot. The NOMOTECH GROUP is committed to the environment. Our technical assets are among the least energy consumers. In order to show this, the technical setups of all our technical assets are provided to our customer allowing them to fully understand the environmental impact. It also gives a full transparency on this information. The NOMOTECH GROUP asks its subcontractors on its behalf to take into account the environmental aspects. The concept of respect for the environment is a criterion for the selection of subcontractors and suppliers. We strive to build partnerships with responsible industrial companies.